"100% Profit Pulling Kit Gives Everyone The Power To Create Niche Websites"
If you have spent any amount of time online recently, you have no doubt seen the word "Niche" all over the place. It seems to be the newest buzz in product creation and promotion! In fact, many online marketers are focusing their entire online business strategy around this one word. Mind you, some of these marketers are well experienced in the whole eBiz game. And they're making a huge profit by doing it too. Now it's your chance to do the exact same thing they are, and this is the product that will help you achieve it. By using a "Niche" product, you can harness the power of it to virtually explode your profit potential by leaps and bounds. How can this be done you may wonder? First, you need to understand exactly what a "Niche" is. Only then can you effectively use it to create not only one profit generator, but as many as you can handle running! Simply put, a "niche" product is a product, service, website, or offering that you can imagine focusing on a specific topic or subject. By choosing general subject matter there is just too much competition. For example, say your business specializes in web design. How much competition do you think there is for this service? There are literally thousands of web design and development companies throughout the whole of the internet. All in stiff competition with each other. But what if you decided to narrow down the general catagory of web design by offering something a little different? Let's say, for instance, that you made a decision to only focus on creating web designs for sports related websites. Ah Ha! There is your niche! You are reducing the amount of direct competitors you have by refining the type of design services you offer. In addition, you are also creating a targeted market for your selected services this way. So now that you know just what a "Niche" product is and how you can use it to your advantage, let's discuss how Scripts2Sell uses the power of "Niche" to generate multiple streams of income for you instantly without the need for extensive product creation experience tactics on your part. Even with only some of the scripts retail values listed above, that's still a Grand Total worth almost $2,000!! As you can see, with the scripts included inside Scripts2Sell, you can make a Payment Processor website like PayPal, an auction website like Ebay™, a Random Payout System Member website like WebStars or DollarRain, a Paid 2 Read Email website, a Dating or Personals website, a full blown online store, your very own Webring, a Subscription website, a Pay-Per-Click website, a Portal or Directory website like Yahoo!®, or even create your own Blog-For-Profit website, plus others I haven't even mentioned! Most, if not all, of the scripts listed above come with installation instructions making it possible to do installations yourself. In turn, saving you hundreds on installation fees alone! Many times professional programmers charge hundreds just to do one script install, let alone 35! Not only do you receive all those fantastic scripts listed above, but when you decide to purchase today, you will also get Lifetime Upgrades absolutely FREE! That means whenever anything new is added or a new version is created, you will receive it completely free of charge when it is released without ever having to repurchase anything again! But if all that isn't your cup of tea, Scripts2Sell is also a profitable website/product in and of itself! When you purchase just one copy of Scripts2Sell, you never even have to use any of the products found within it to start earning a profit. Because Scripts2Sell has been designed to be resold indefinitely! Scripts2Sell package includes a copy of this exact salespage, an easy to adjust "thank you" page to make sales automation extra easy, and a special product download ebook that you distribute to your customers after a successful payment without anything further to do! All downloads are run directly from my own website so you never have to worry about super high bandwidth costs eating worm holes into your profit pile. And if all that simply isn't enough to convince you, I'll even give you a Risk-Free 30 Day 100% Money Back Guarantee with your purchase. That gives you 30 days to use it, test it, and sell it. 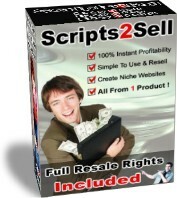 If Scripts2Sell isn't everything that I say it is by all means, get your money back for your purchase. But I know you will see the value hidden within Scripts2Sell and love it just as much as I do! So let's quickly re-examine everything in this One-of-a-Kind offer. You get 35 outstanding scripts to create niche websites with, all downloadable from one small master ebook, a copy of this very salespage you can customize for easier reselling, along with a pre-built "thank you" page to direct your customers to after their successful purchase which you keep 100% of all profits from, Lifetime Upgrades to Scripts2Sell, and of course Full Resale Rights to the entire package with your purchase. Copyright © 2004 E-Book Emporium. All Rights Reserved.